Thaw frozen cauliflower and broccoli and drain liquid. If using fresh vegetables, cook first until barely tender. 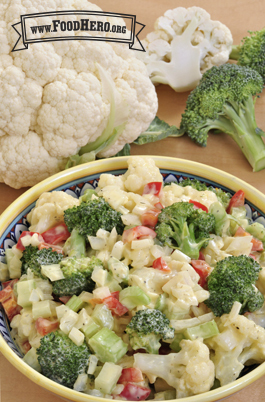 Combine cauliflower, broccoli, celery, onion and bell pepper in serving bowl. In a small bowl, mix mayonnaise, yogurt, mustard, salt, pepper and dill. Stir dressing gently into salad. Chill before serving. 1 Comments for "Cauliflower Salad"
Made this recipe for two back to school nights, it was a hit! Parents really liked that the recipe had non-fat plain yogurt in it and many said that they will be making it at home.